Maybe, the worst kept secret during draft season has been the Denver Broncos infatuation with Missouri quarterback Drew Lock. With every report that has surfaced in relation to Denver and Lock, one thing has remained the same, the interest level is high. In today’s draft world, NFL mock drafts rule the roost until draft night officially hits on April 25. No matter which site you visit for mock drafts, one thing is likely to go unchanged, and that is Lock slotting in at pick No. 10 to Denver. A match between Lock and the Broncos is the easiest connect the dot game ever played, and it all surfaces around one person, John Elway. The Broncos general manger and president of football operations certainly has a type when it comes to quarterbacks, and Lock fits the bill. What Lock has that most Elway drafted quarterbacks also possessed — specifically Brock Osweiler and Paxton Lynch — is height and build of a prototypical pocket-passer. 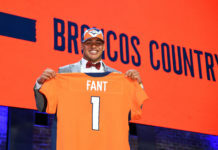 Standing at 6’4” and weighing in at 225 pounds, Lock is the average height and weight of an NFL quarterback and certainly fits the profile of what the Broncos like. Both Osweiler and Lynch were 6’7” and even though Lock is three inches shorter than both, the similarities are still there. All three are pocket passers and put up big time numbers in college, but the one thing Lock has over the other two is heightened athleticism. What you get in Lock is not just a precision passer in the pocket, but a quarterback that can use his legs just as effectively. During his four-year career at Missouri, Lock rushed for 437 yards and a career high 175 during his senior season. He also carried the ball for nine career touchdowns and showed a willingness to make plays with his feet whether it was by design or improvisation. 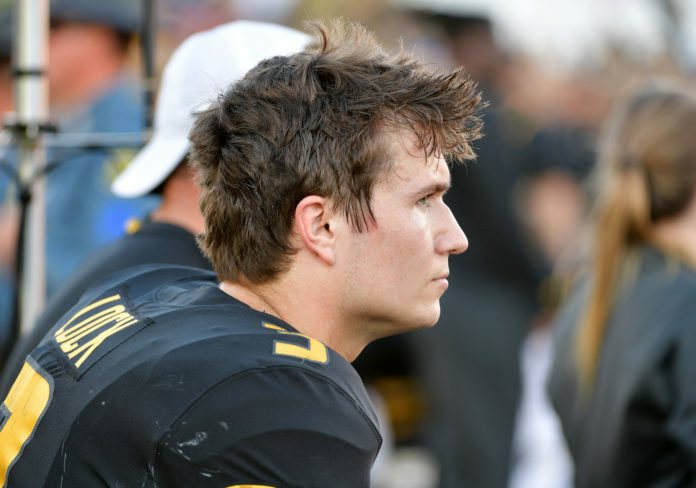 Watch: #Mizzou QB Drew Lock had one heck of a senior day. That play was obviously by design, but it shows Lock’s willingness to be just as effective as a rusher as he is a passer. What Lock also benefited from during his senior season was an opportunity to perfect his craft before taking his game to the next level. Even though Lock’s numbers took a hit from junior to senior year, 44 touchdowns compared to 28, the extra season did make him more comfortable for the spot he is currently in. Lock stole the show during his press conference in Mobile, Ala. as he displayed a confidence that is almost unmatched in this draft class. That was just the start of Lock’s solid week though as he maneuvered himself past every quarterback that participated at the Senior Bowl. Duke quarterback Daniel Jones was Lock’s greatest competition going into the week, but once Senior Bowl week came to a close, it was clear which of the two quarterback prospects was better. What Lock showed in Mobile was solid footwork that often times was questioned during his college career. Too often would Lock throw passes off-balance and not step into his passes because his feet were out of position. That is something Lock has clearly been working on from the time he left Missouri to now, because he showed off an arm strength in Mobile that has a direct correlation to his footwork. “As far as rhythm and timing goes and footwork in the pocket, I think a lot of light I can shed on that was just coming from mid-season adjustments,” Lock explained. “I kept my same footwork from my sophomore and junior year going into my senior year with a completely different offense. The footwork was what I felt comfortable with, the offense was something new, so we weren’t trying to change everything. Lock did just that as he had a solid finish to his senior season, which allowed him to draw top-10 buzz coming into the Senior Bowl. It is not just what he does on the field that makes Lock so special though as he also has charisma off the field to pair with it. That was Lock’s reaction when asked whether he is the best quarterback in this draft class, which he replied with a wink and a little, “you betcha” point for emphasis. That confidence is something this Broncos team needs, and it is something Lock would provide the moment he walks into Dove Valley. While Broncos fans didn’t love what they saw from him in 2018, next season, Case Keenum will likely be the Broncos starter for at least one more year. Sitting behind Keenum for a year might not be the worst thing for Lock since it would give him a chance to learn the system for an entire year. 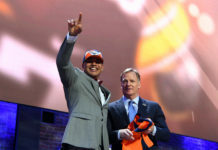 It would also make him fully prepared to take over the franchise in 2020, which seems like a real possibility if the Broncos like Lock as much as it sounds like they do.